"When the lines of destiny meet, the tools it uses are no longer necessary." Just to show how we associate a person with their characters, I was commenting to my editor not too long ago about how funny it was to see Commander Koenig in a roman uniform in Cleopatra. Of course, in Space: 1999 he is wearing some pretty funky bellbottoms, but I have gotten used to this attire since first seeing the show back in the 1970s. With this fourth double-disc set in the series, we wrap up the first season. Once again, we get a heathy dosing of pseudo-science, mixed with some pretty nifty special effects and costuming. Acting is pretty stiff throughout, but oddly adds to the show's character. It's interesting to see an air leak not cause any depressurization (Space Brain) or to find cobwebs in a spacecraft (Dragon's Domain), but perhaps that's just being nitpicky. There's a Troubled Spirit loose on Moonbase Alpha. Dan Mateo (Giancarlo Prette) is performing thought experiments in the Hydroponic Unit when the lights dim, and a sudden temperature drop occurs as Mateo falls unconscious. Back in the medical lab, Helena monitors Mateo's condition, when once again the temperature drops, and she sees a deformed figure approaching her. Mateo's boss orders an end to his experiments, but then turns up dead. The scientific community on the moonbase aren't about to accept that a ghost is walking among them, but something is stalking the corridors, and the crew need to find out how to stop it. Features psychedelic electric sitar music. An investigation of an approaching phenomenon causes an Eagle to go missing. Carter and Kennedy are sent to look for the missing craft, but are recalled when an asteroid hits the moon moments later, and its analysis turns up some alarming conclusions. Kennedy is in shock and the computer is receiving and sending out vast quantities of information—through Kennedy's brain! Is the link to this alien presence hostile, or is it trying to help the Alphans? Find out in Space Brain. A spacecraft that defies all design logic approaches Alpha, and soon gains control of her computer. A voice asks for assistance and permission to land, and while insisting it has peaceful intentions, orders Koenig, Russell and Bergman to meet with it on board its craft. When they arrive, they find an old man (Leo McKern) resting, who introduces himself as Companion, though he indicates he knows why they were brought here, as a list of supply demands is issued. When Koenig decides to confront the visitor, instead of concede to his demands, the survival of Alpha is once again at stake in The Infernal Machine. A giant spacecraft the size of a city approaches Alpha. The moonbase receives a distress call indicating a major disaster has struck, and dispatches an Eagle with Koenig, Russel, Bergman, Carter and Security Man, Bill Lowry (Paul Antrim) on board. They are pulled into a docking bay and begin to explore the ship. Koenig and Bergman are captured by the Darians, led by Neman (Dennis Burgess) and his beautiful young associate, Kara (Joan Collins). Meanwhile, in another part of the ship, Helena and Lowry are also captured, by a group of primitive brutals, who sacrifice anyone found to be in any way mutated. As Neman and Kara outline the possibility of the Alphans joining them on their mission to Koenig, there is part of the story he is not being told. Does this massive ship hold the Alphan's future, or is there something amiss in Mission Of The Darians? Can the past return to haunt you? For astronaut Tony Cellini (Gianni Garko), it can. Cellini has been a longtime friend of Commander Koenig, and in 1996 had led an expedition out beyond Pluto where a new planet had been discovered by Professor Bergman; but he returned without his crew and with a fantastic tale of dragons as his explanation. Helena Russell had been assigned to his case, and had diagnosed him as a borderline hysteric, while Koenig and Bergman had reason to question whether his reports were at least partially valid. Now, with Alpha in deep space, the nightmare has returned, causing Cellini to act irrationally by trying to steal an Eagle and head off into space in his pajamas. Is this all just a grand illusion, or did he really enter the Dragon's Domain? As the moon approaches another planet, its course is altered though the computer confirms it is neither gravity or magnetic forces responsible. Suddenly, the moon begins to decelerate, and finally comes to a stationary position in orbit around the planet. Power levels are dropping rapidly, and Koenig orders a survey team to the planet surface, which scans as a dead world, though previously sustaining life. With the Alphan life systems failing, Koenig must decide between remaining on Alpha or trying to bring the planet back to life. The discovery of skeletons and mysterious writings on a cave wall spark events that may jeopardize the future of Alpha, and lead team members Anna Davis (Lisa Harrow) and Luke Ferro (Orso Maria Guerrini) to actions they can not explain after reading The Testament Of Arkadia. Image Transfer Review: The first episode of this set looks the best out of any so far. Edge enhancement is barely present; the image looks soft but natural, but there are a couple of blurring anomalies present. The the other episodes contain the usual issues I've seen in this series, aliasing (though not as bad overall, highly dependent on the episode), interlace artifacts, interference and moire in tighly spaced lines and some grain. For the most part, the image looks quite good, but when something looks bad, it's usually pretty distracting, like the obvious color problems in Dragon's Domain, (yellows turning peach colored), or the overly dark transfer and color shifts in Testament Of Arcadia. Audio Transfer Review: The audio sounds like a 1970s TV series, with limited frequency response and a fairly midrange sounding musical background. Distortion is present in a few places, and there are a couple of dropouts here and there. Helena's voiceover in Dragon's Domain contains a lot of hiss, though this is source-related, as the other audio in this episode is fine. Serviceable. Extras Review: Once again, both discs include photo galleries, primarily consisting of screen grabs, with a few publicity shots included. Image quality is pretty bad, highly oversharpened and rife with halos as a result, high contrast and off color, looking extremely unnatural. On top of that, only a single frame is included for Dragon's Domain, one of the most popular episodes. Set number four is housed in a red box, and the individual cases feature Martin Landau and Barbara Bains, singly on the covers, as each set has. A synopsis for each episode is included on the back of the outer case with only a single-sided ad for other A&E box sets as an insert. The big dissappointment with this set is that it does not include the behind-the-scenes documentary it was supposed to feature (which is still listed on several e-tailers' sites). We do get 19 of the 24 original broadcast trailers for the first season, which are basically the clips seen at the start of each episode. Breakaway, Matter Of Life And Death, Ring Around The Moon, Black Sun, Earthbound, Another Time, Another Place, Guardian Of Piri, Force Of Life, Alpha Child, Missing Link, Voyager's Return, Last Sunset, Collision Course, Death's Other Dominion, Mission Of The Darians, The Testament Of Arkadia, Dragon's Domian, Space Brain and The Last Enemy are included, running approximately 35 seconds each. These look pretty good for their 16mm sources, and some have better color timing than the actual episodes. 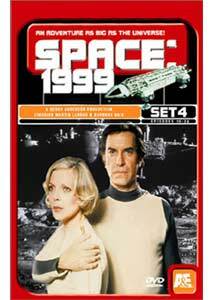 This fourth set contains some of the best episodes and concludes the first season of Space: 1999. So far, the series has been variable in terms of picture quality, but still strikes me as better than I thought it would look. Since I grew up watching this show, I'm really looking forward to the second season, despite the fact that many people dislike it. If you are a Space: 1999 fan you won't want to miss these, but don't get your hopes up too high.